We live in interesting times, and our NCTA Board of Directors always seeks to find interesting and, above all, relevant topics for the presentations and workshops we organize. The contributors to this issue cover the spectrum of what we can offer to our members, and that’s the strength of belonging to an organization like NCTA. In each issue, we try to present material from experts who supply needed assistance with the diverse challenges that we translators and interpreters confront. From May to September this year we had two NCTA General Meetings, started a bilingual book club, and enjoyed other social events. If you have not already done so, please join our Meetup group. It is a great avenue for networking, sharing ideas, and perhaps connecting with your next project lead. We welcome your suggestions of topics and locations for meetups. Scams are on the rise in online commerce. Learn about the three most common types of fraudulent schemes in the language industry, along with steps you should take to protect yourself against them. Translators who usually specialize in other niches sense a big opportunity in subtitling and have acquired newfound interest in translating audiovisual content. These newcomers should not underestimate the learning curve they will face. For the past twenty years, I’ve had the good fortune to work as a French to English translator, with projects ranging from patents to literary criticism. Earlier this year, I decided to (gradually) retire, a prospect prompting both a look back and an anticipation of what may lie ahead. Here’s my story, along with a few thoughts on concluding my years in translation. The Interpreters Guild of America (IGA) was created to protect the rights of interpreters, who bear tremendous responsibilities and are vulnerable to a number of professional challenges. → Read more here on Translorial.com. 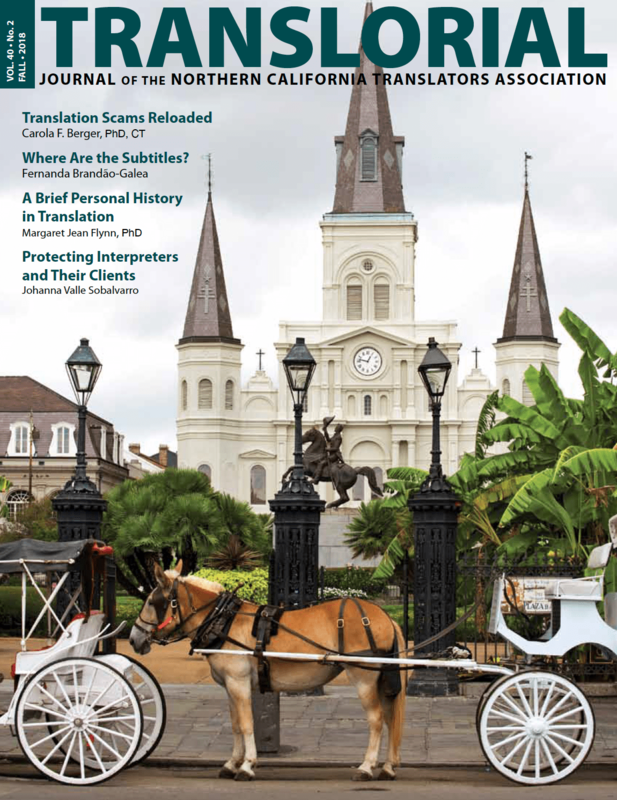 translorial posted this article under Continuing Ed., Court Interpretation, Interpretation, Localization, NCTA Events, NCTA Meetings, Opinion, Perspective, Scams, Translation, Worthy of a Visit	on Tuesday, October 16th, 2018 at 4:14 am	You can follow any responses to this entry through the RSS 2.0 feed. You can leave a comment or trackback from your own site. Next Article → The Principle of Confidentiality – Do interpreters have the right to remain silent?